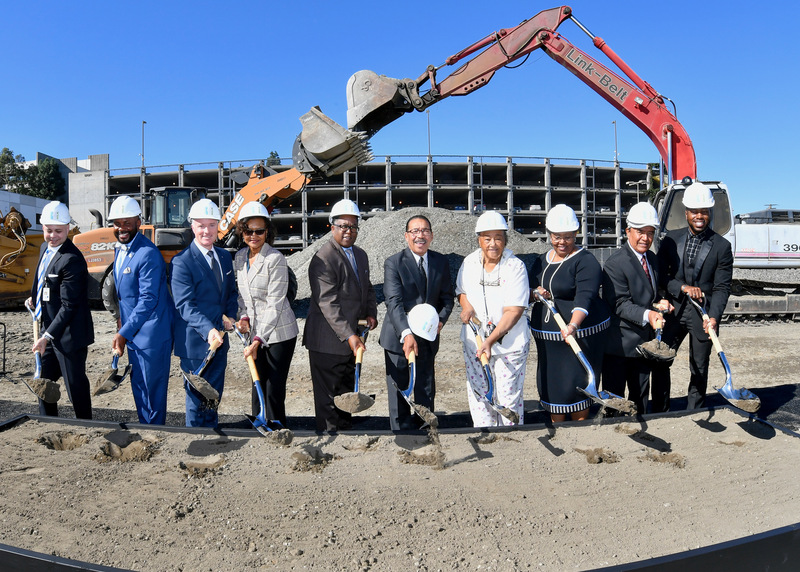 Supervisor Mark Ridley-Thomas led the groundbreaking ceremony for the newest addition to the Martin Luther King, Jr. Medical Campus in Willowbrook: a medical office building that will increase access to healthcare in South Los Angeles by creating more space for physicians to care for patients. Scheduled to open in 2020, the MLK Community Health Medical Office Building will provide primary care for the local community, as well as valuable services to treat chronic conditions. Outpatient services will include dialysis, wound care, and imaging. There will also be an ambulatory surgery center, a retail pharmacy, and a space for community health education. The 52,000-sq. ft. MLK Community Health Medical Office Building will be the new home of the MLK Community Medical Group, which recruits doctors from prestigious medical centers across the nation who have a desire to serve in a safety-net community. 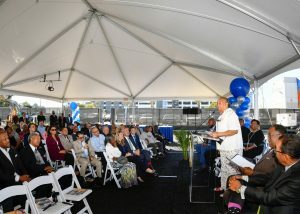 Dr. Jorge Reyno, MLK Community Hospital Vice President of Population Health, is one of the doctors looking forward to having an office at the new building. “It will serve as a hub to improve outcomes, and an important bridge between inpatient and outpatient care, supporting our work in care management, and helping us achieve our goals for patient and community wellness,” he said. Several members of the community expressed their enthusiasm for the project, including Sweet Alice Harris, Arna Fulcher of the Empowerment Congress, and Arturo Ibarra of the Watts/Century Latino Organization. Developed in partnership with Trammell Crow Company, the project is expected to create 200 construction jobs. It is only the latest addition to the still-expanding MLK Medical Campus, which besides the MLK Community Hospital and MLK Outpatient Center, also includes the MLK Center for Public Health, the MLK Mental Health Urgent Care Center, and MLK Recuperative Care Center. 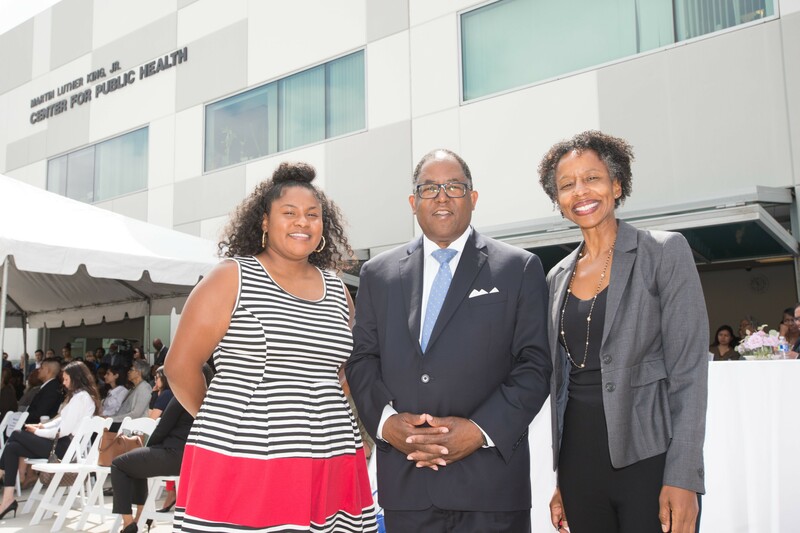 Supervisor Mark Ridley-Thomas along with the Los Angeles County Department of Public Health, and community partners unveiled the new Community Healing and Trauma Prevention Center at the Martin Luther King Jr. Center for Public Health. The Healing Center will serve a community that experiences the highest rates of assault-related trauma and homicide in Los Angeles County. Homicide rates in South Los Angeles are nearly four times higher than the rest of the county. 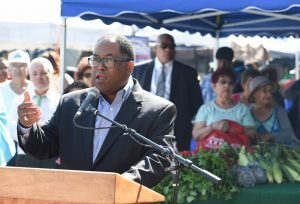 Supervisor Mark Ridley-Thomas addresses over 100 attendees at the Community Healing and Trauma Prevention Center unveiling. The Healing Center was developed with input from community leaders to ensure that the services provided reflect the community’s desires and focus on both healing and organizing for change. Support was provided by various agencies including the Los Angeles County Departments of Public Health, Health Services and Mental Health, MLK Community Hospital, MLK Outpatient Services, Saint Francis Medical Center, and Charles R. Drew University. The Los Angeles District Attorney’s Bureau of Victim Services and members of the Community Action for Peace also participated in the development of the Healing Center. 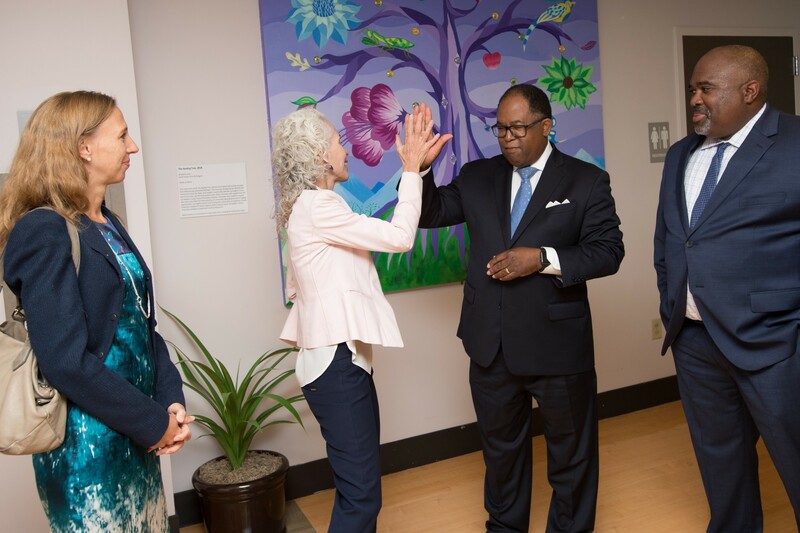 Supervisor Ridley-Thomas high fives Dr. Barbara Ferrer during a tour of the Community Healing and Trauma Prevention Center during its opening. “The Community Healing and Trauma Prevention Center provides a safe space where residents can access support and services, where young people can develop their leadership skills, and where community partners can work together to tackle the root causes of complex trauma in South Los Angeles,” said Barbara Ferrer, PhD, MPH, MEd, Director of Los Angeles County Public Health. The Healing Center will build upon Trauma Prevention Initiative strategies in partnership with the community to create a comprehensive approach to violence prevention and intervention. For the past 3 years, the Trauma Prevention Initiative has been investing in community engagement and key violence intervention and capacity-building strategies to coordinate strategies across the lifespan, leverage resources of existing programs and develop innovative strategies, policies, partnerships, and strategic opportunities. and embraced something totally new. Published with permission from POLITICO. Click here for the full story and photos. LOS ANGELES — If you want a glimpse into the future of American hospitals, this corner of South Central Los Angeles might seem an unlikely stop. Caught between Compton and Watts, the Willowbrook neighborhood is better known for a history of gang violence and race riots. Its previous hospital, the old Martin Luther King Jr./Drew Medical Center, was dubbed “Killer King” and shuttered in 2007 after horrific stories of patients being given the wrong drugs, preventable deaths and other incidents of mismanagement or incompetence. Today, that building is still there, a hulking concrete carcass that represents one of the bleakest chapters in Los Angeles County’s health history. And next to it is a gleaming new hospital that opened its doors two years ago, reorganized and built from scratch. Though King/Drew ultimately failed the community, the county-run hospital was also the only source of health care for hundreds of thousands of residents of this poverty-riven area of the city. Its emergency department had been the place mothers went to deliver babies, children were brought if they had high fevers and gunshot victims were sewn up. Its closure effectively left one of the city’s most vulnerable communities without access to health care. So when a group of community leaders and elected officials started to plan for King’s replacement, they did something bold: Instead of even considering fixing up the old hospital, they decided to start fresh and build a new one. And to do that, they would have to rethink the very concept of what a hospital is and what it does. The new private, nonprofit Martin Luther King Jr. Community Hospital is a nearly $300 million medical center that shares the same county-owned grounds as the old hospital, but little else. For one thing, the new hospital is much smaller, with just 131 beds compared with the old hospital’s 233 beds. Instead of being the sole source of a whole area’s medical needs, the new hospital is designed as the hub of a wide network of clinics, neighborhood outposts designed to provide the day-to-day care residents need. The hospital itself focuses instead on acute-care and highly specialized services for a smaller but sicker group of patients. But perhaps the biggest difference is the vision. The hospital is just one part of a larger system to improve the lives and protect the health of its residents—a system that extends well beyond medical care. The county is creating new senior housing and additional services, working with the hospital to bring healthier food options and even more jobs to the area. Meanwhile, the hospital is working to provide more outpatient services outside its walls and to support the county in revitalizing the community. In fact, in many ways, the hospital of the future is an un-hospital. Instead, it’s a wellness network with a small hospital at the center, providing critical care for the small number of acute illnesses and injuries that can’t be addressed in any other setting. The vision isn’t complete yet, but it already includes some components that might not normally fall under a hospital’s purview. 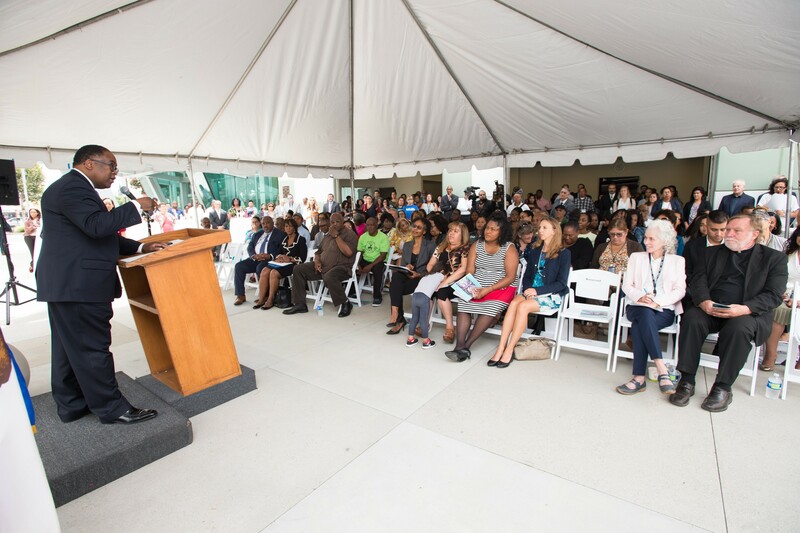 On a recent day, L.A. County Supervisor Mark Ridley-Thomas, widely credited as the elected leader most responsible for the hospital’s rebirth, paid a visit to the campus and pointed out what parts already exist and which are in the works. In front of the new hospital was a farmer’s market—an effort sponsored by the county to combat the neighborhood’s lack of fresh fruits and vegetables. A new behavioral health center will soon open in the concrete building that housed the old hospital. Ridley-Thomas pointed to existing structures across the street – near the King/Drew Magnet High School of Medicine and Science – and noted plans to build a new senior center, a community library and a new Willowbrook/Rosa Parks transportation hub. Ridley-Thomas called it “a state-of-the-art way of operating a medical campus.” By the end of 2019, the county will have invested more than $1 billion in a revitalization effort that’s expected to bring at least 2,700 jobs to the area. That larger vision of trying to take care of the community – not just treating patients in the hospital – is what puts Martin Luther King Jr. Community Hospital in the forefront of where U.S. health care is going, said Bruce Leff, professor of medicine at Johns Hopkins University School of Medicine and director of the university’s Center for Transformative Geriatric Research. Leff described the new facility as having “a leg up” on other hospitals in trying to do that. Most hospitals are so established in their thinking and in their communities that it’s hard for them to rethink their mission. South Central had a chance to turn the tragedy of the old hospital’s closing into an opportunity to shed old thinking, an old facility and take a giant step into the future. And along the way it had a chance to figure out how to address the social factors that public health experts increasingly believe have more to do with your health than any hospital, factors like poverty, access to good food and education. The old King/Drew hospital opened in 1972 with the best intentions. Born out the 1965 Watts race riots, which left 34 people dead and more than a 1,000 injured in an area that had no medical facility, the King hospital and its affiliated medical school, Charles R. Drew University of Medicine and Science, served as a source of pride for the neighborhood just south of Watts, which at the time was predominantly African-American. It was named after two African-American icons – King, the civil rights leader, and Drew, a pioneering physician who developed blood banks. The hospital was a huge boon to the neighborhood. Before the original hospital opened, 83-year-old Alice Harris, a community organizer and mother of nine known in the neighborhood as “Sweet Alice,” remembers tending to her neighbors’ needs with a little bag filled with alcohol, Band-Aids, aspirin and cough medicine she made herself. “If a child got ran over in the street, he was going to die because it would be three hours before the rescue would come,” said Harris, who at the time was working as a hairdresser in her home in the housing projects. But over the years, King/Drew hospital’s reputation dropped to the bottom ranking among American teaching hospitals and became rocked by allegations of incompetence, medical errors and needless deaths. A Pulitzer Prize-winning series published in 2004 in the Los Angeles Times recounted appalling stories: a meningitis patient being given a powerful anti-cancer drug for four days, employees pilfering and in some cases selling hospital drugs, nurses failing to monitor patients’ vital signs. Medical mistakes, the Times reported, cost the county more than $20 million in malpractice payments from 1999 to 2003. In a particularly harrowing tale from 2007, a woman died after writhing in pain for 45 minutes on the waiting-room floor while the hospital’s surveillance cameras show a janitor mopping up around her. To many residents like Harris, those stories were overblown and, in her opinion, unfair or even fabricated. The hospital and trauma center filled their needs, and remained a point of pride. Allan Avant, who grew up in Watts, didn’t think the “Killer King” moniker was related to its reputation for poor care. “A lot of people would go in there for gunshot wounds and end up dead,” said Avant, 58, adding he always considered it to be a good hospital. But those breakdowns in care eventually caused the hospital to lose its accreditation and shut its doors. The closure forced many residents to travel longer distances for care, or simply to forgo it altogether. The challenges it faces are broad and deep. The new hospital’s service area – approximately a three-mile radius from the hospital that includes residents of Los Angeles, as well as nearby cities such as Compton, Carson and Gardena – has some of the worst health outcomes and inequities in the state. There’s a dearth of doctors, which is typical in underserved areas but exacerbated by the exodus of primary-care and specialty physicians after King/Drew closed. (A study conducted earlier this year found a shortage of more than 1,200 doctors in the area it serves.) Fewer than half the adults in the area speak mostly English at home, a statistic that requires the hospital to translate materials, have caregivers who speak Spanish and use technology to provide interpretation in less common languages and dialects. About a third of the region lives at or below the federal poverty level and more than 40 percent lack a high school diploma. Health outcomes are also poor, with mortality rates for stroke and coronary heart disease about 30 percent higher than the county overall. The area lacks many of the features – access to healthy foods, safe spaces for walking and exercise – vital for good health and instead has too many liquor stores, high rates of crime and other factors that create stress and disease. These might not seem like a hospital’s problem, but ultimately that’s where they land. Public health experts are increasingly convinced that addressing such issues—what medical and social scientists refer to as the “social determinants of health”—is crucial both for patients and for building a cost-effective health care system. Rather than just treating the illnesses that result from all these factors, they’re looking for new models of health care that can address those problems at the root, as well as deliver more traditional medical services. The longstanding role of the public hospital is to serve as a safety net and take care of the community’s most vulnerable patients, regardless of their ability to pay. But the bottom line is that government has been getting out of the business of running hospitals for decades because of financial and logistical challenges. California, which has 58 counties, has only 15 county-run hospitals. Most safety-net hospitals are now run by private, nonprofit entities, or academic institutions like the University of California. Overall, nearly a fifth of California’s hospitals are run by state or local governments, nearly 60 percent are nonprofit and about 22 percent are run by for-profit companies – which puts the state on par with the national average, according to the Kaiser Family Foundation. Katz acknowledged that while government can do some things well, it’s not very flexible and can be mired in red tape. King’s private structure allows the hospital to make decisions like who to hire and what technologies to purchase more swiftly and efficiently. It can fundraise more effectivel, since most people don’t want to donate money to organizations they already fund with their tax dollars. The Affordable Care Act’s expanded coverage and the hospital’s partnership with the county and the state provide essential stability. The nonprofit hospital operates on an annual budget of about $250 million and has remained financially viable despite serving a patient population that relies heavily on government programs. Batchlor is concerned about the ongoing threat to the ACA and the future of expanded Medicaid, but says she doesn’t let that overwhelm her focus. “We’re not stressed. We’re doing fine and we manage our resources appropriately,” she said, adding that the hospital receives special funding to support its safety-net mission and has raised more than $25 million in private contributions since it opened. Batchlor made it a mission to make sure that every doctor who works at the hospital is board-certified to help ensure the consistency and quality of care that had been lacking under the old regime. In addition, staff members called navigators or “care coordinators” are assigned to every patient on admission, regardless of the level of care needed. Other hospitals tend to use navigators just for the sickest or most complex patients. The hospital has been open for just two years, so it’s difficult to gauge its impact on the community’s health. Many of its innovative measures take time to assess. But Batchlor is proud of early signs that point to success. Nearly 90,000 people have been treated by the emergency room, more than twice what was initially projected. While the hospital hopes soon to be able to treat more people in outpatient settings, the high volume of ER visits speaks to the pent-up need in the community for care, as well as residents’ confidence in the new facility, Batchlor said. Unlike its predecessor, the new hospital does not have a trauma center, nor does it have any plans to build one. Trauma centers, which handle the most difficult emergency cases and require high levels of staffing with specialists, are especially costly to operate. Instead, the hospital’s leaders decided to focus on providing better preventative and primary care and to send complex trauma victims to California Hospital Medical Center, about 10 miles north in downtown L.A. Drawing doctors back to the area is high on the medical center’s priority list. The hospital is working with the county to construct a new medical office building on campus to provide space for outpatient care. Meanwhile, in December, the hospital formed a medical group and opened its first outpatient center, a post-discharge clinic tucked away in temporary digs in a strip mall with a Fat Burger in nearby Compton. The medical group is small, with about a dozen physicians, but will grow, especially once it has a permanent home. That mission, along with building a new practice from scratch, also drew Alan Kaplan, a urologist who completed his residency at UCLA and is working on his MBA. He started working at the hospital and the outpatient clinic on Aug. 1. For Kaplan, technology could be a component of that mission. More than 80 percent of the people in the area have smartphones, and he imagines tapping into that in different ways to provide care and ensure follow up. “There are a lot of ways we can leverage technology and the IT we have to address the social determinants of health,” he said. But the biggest challenge, Kaplan said, is convincing people who are used to going to an emergency department for care that they can get appropriate, or even better care in a clinic or doctor’s office. Kaplan said that’s a challenge because many patients may have never had a regular primary-care doctor. They may not know they can get care in a clinic, but they know they can go to the hospital. While the trend toward shifting care out of hospitals to less acute clinic settings has been going on for years, if not decades, around the country, it’s still a hard sell and a balance that’s difficult to achieve. Martin Luther King Jr. Community is attempting to build that, along with its larger vision of redeveloping the surrounding neighborhood over the next few years. Health care futurist Ian Morrison, who serves on the hospital’s board of directors, actually floated this question to its founders before the medical center was completed: if care is being pushed outside the medical center, do they really need a new hospital at all? For now, at least, Morrison said, hospitals are still necessary. “If you look at the numbers, in even the most extreme sense of futurism, there are still going to be sick people who need acute care done on an emergency basis,” Morrison explained. So far, he described the new hospital as being successful, calling it “a hub of excellence” in a community with a long history being medically underserved. But beyond that, the health of underserved communities need to be tackled on a broader sense. Hospitals around the country are looking at different ways to manage issues such as connecting patients with lawyers to resolve legal or landlord-tenant issues that lead to poor health, such as mold abatement, or helping the homeless find permanent housing. But a lot of these efforts are handled piecemeal. “Although our mission is really to provide acute care for the community, we are continually finding ourselves saying to do it well, we have to go beyond the walls and into social determinants of health and population health,” Morrison said. Morrison hopes that Martin Luther King Jr. Community Hospital’s more holistic approach of involving the county and other partners in transforming the neighborhood will, within the decade, yield impressive results in improving overall health status. For “Sweet Alice” Harris, who never wanted the old hospital closed in the first place, she described having a new hospital back in her neighborhood as heavenly. 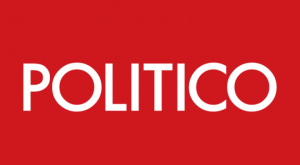 Victoria Colliver is a health care reporter for POLITICO Pro based in California. All photos by Diandra Jay / Board of Supervisors. 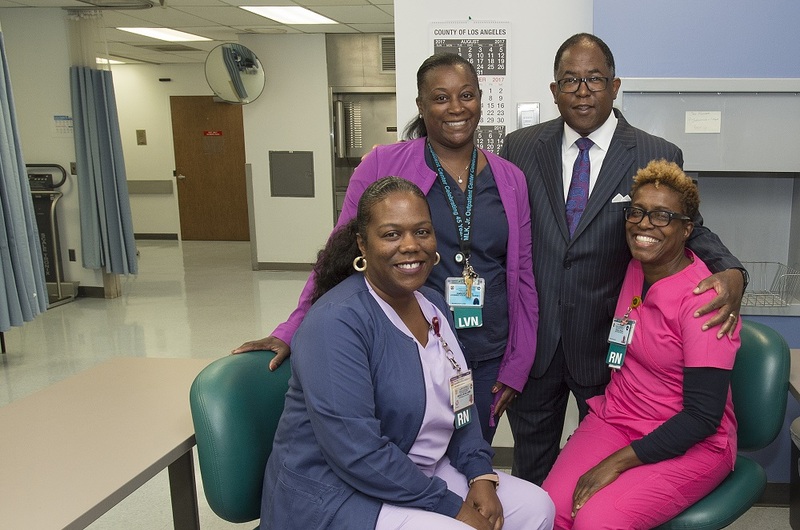 The Martin Luther King, Jr. Outpatient Center celebrates the first anniversary of its Sickle Cell Disease Clinic to serve adults suffering from this painful and sometimes deadly blood condition. It is estimated there are 5,100 sickle cell patients in Southern California, most of whom are African American. Sickle cell disease can lead to numerous complications, including anemia, recurring pain episodes, respiratory troubles, and even death. 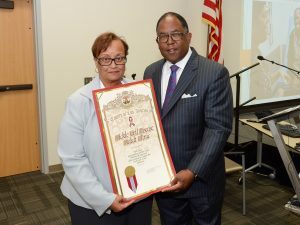 “It has been a great year for advancing treatment of sickle cell disease in the County of Los Angeles,” said Los Angeles County Board of Supervisors Chairman Mark Ridley-Thomas at the clinic’s recent celebration of its first year in operation. Earlier this year, the Food and Drug Administration (FDA) approved a new medication called Endari that was developed by researcher Dr. Yutaka Niihara from LA Biomed and the Harbor UCLA faculty to help treat the condition. Once thought of as a childhood illness, sickle cell disease is also common among adults since many with this condition are now living into adulthood thanks to improved treatments. But it can be challenging to find clinics with the expertise and resources to appropriately manage patients with this complex condition. “Adults with sickle cell disease deserve health care providers that understand the disease, its complications, and their pain. Knowing the people who worked hard to open this clinic gives me confidence it will meet the community’s needs,” said Mary Brown, Director of the Sickle Cell Disease Foundation of California. The new clinic is the first new focused facility in decades built to serve adults in Los Angeles County with sickle cell disease. 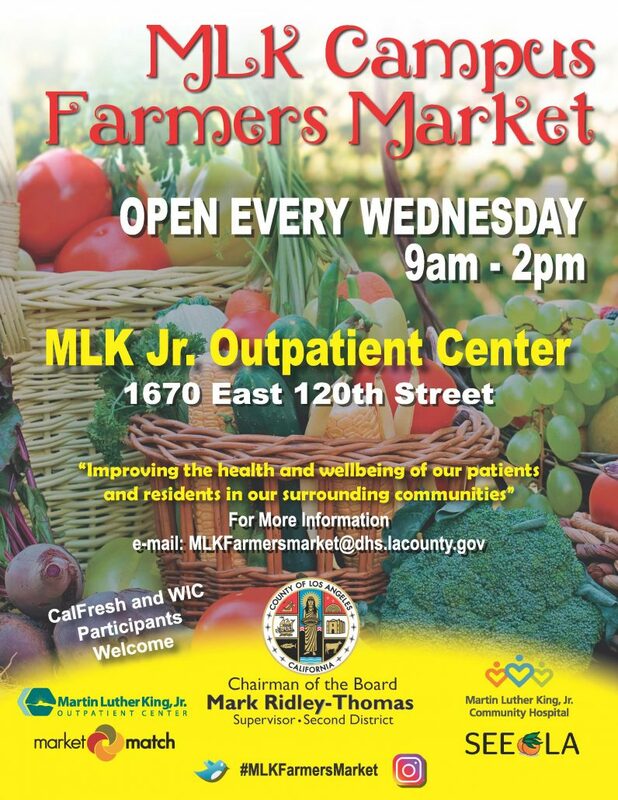 The Martin Luther King, Jr. Medical Campus now boasts of hosting the first farmers market at a Los Angeles County medical facility. The wellness center seeks to promote healthy habits within the Willowbrook community, and the weekly farmers market represents the latest innovation and addition to the campus. 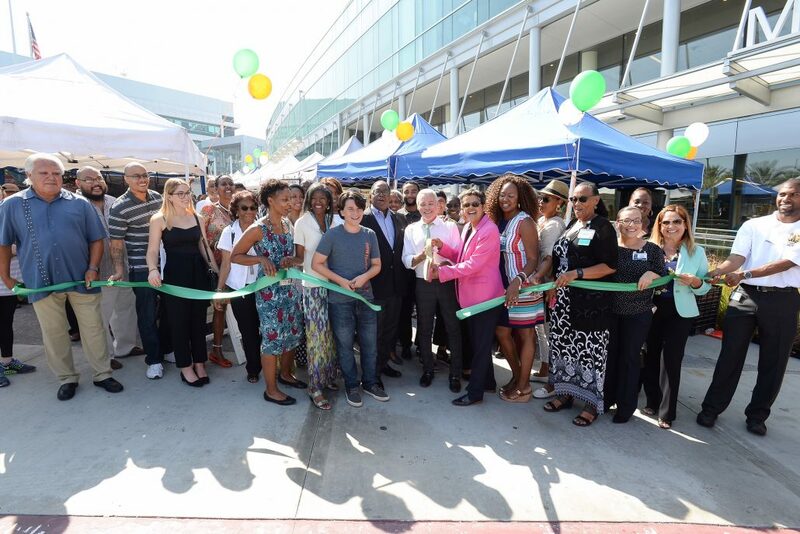 “Access to fresh and affordable fruits and veggies allow for the formation of healthy habits,” said Los Angeles County Board of Supervisors Chairman Mark Ridley-Thomas at the ribbon cutting for the new farmers market. 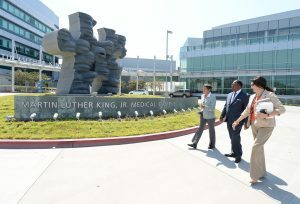 The collaboration is the result of a partnership among the Office of Supervisor Ridley-Thomas, Sustainable Economic Enterprises of Los Angeles (SEE-LA) and the MLK Outpatient Center. SEE-LA is also providing weekly nutrition classes in English and Spanish through a grant from the Department of Public Health. At the market, patrons will be able to use CalFresh EBT cards and WIC checks. Additionally, SEE-LA offers “Market Match” which doubles the purchasing power of WIC fruit and vegetable checks and CalFresh up to $10 per day. “This is your market and we hope you use it,” said James Haydu, Executive Director of SEE-LA. The Farmers Market features fresh produce as well as local vendors– just the prescription for fighting obesity and other chronic diseases. “But it’s also part of the prescription for being able to get outside, meet your neighbors, and enjoy your community,” the Supervisor said. The farmers market will be held every Wednesday from 9 a.m. to 2 p.m. along the breezeway between the MLK Outpatient Center and the Community Hospital.